There is nothing like surprising your loved one with a wine gift basket for that special occasion. It is the perfect gift for occasions such as anniversaries, weddings, promotions and birthdays. Show your loved one how much you care with the following wine lover gifts. 1. Refined Elegance Wine Themed Gift: Your loved one is sure to feel elegant when they receive this basket full of wine themed items. It features a delicious wine glace for mixing their own drinks, and the snacks include crackers, cheese spread, wine biscuits, caviar and cookies. Everything is arranged inside an attractive black faux leather container. 2. 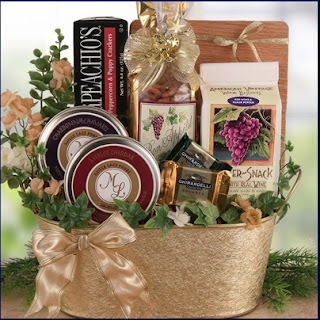 Grand Vineyard Collection: This beautiful gift basket is full of unforgettable wine themed gifts. The contents include seasonal drinks, wine glace and premium coffee. Your loved one can find snacks such as wine biscuits, cheese spread, cookies and assorted chocolates. It also includes a cheese cutting board. The contents come arranged inside a reusable handled basket. 3. Beary Fun Gift Tower: Your loved one is sure to adore the soft, purple teddy bear on a tower of wine themed gifts. It comes with a wine glace for mixing their favorite drinks, and the snacks include wine biscuits and cookies. The gifts come inside several striped hat boxes of various sizes. 4. International Wine and Gourmet Chest: You can celebrate any occasion with delicious wine and gourmet snacks. Your loved one is sure to enjoy the rich flavors of the Tormaresca Red Blend and Louis Jadot Beaujolais-Villages Gamay wine. The wine tastes great with gourmet snacks such as crackers, cheese spread, red pepper and feta spread, wine salami and smoked salmon. The cookies, caramels and toffee bites are sure to satisfy their sweet tooth. It also includes a wood-handled cheese spreader. The wine and snacks come inside a beautiful chest. 5. Wine and Gourmet Extravagance: This amazing gift basket is full of red wines and gourmet snacks. Your loved one can savor the rich taste of the Cress Zinfandel and Istro Cabernet Sauvignon. The gourmet snacks include caviar, crackers, cheese spread and smoked salmon. It also includes sweet treats such as cookies, almonds and toffee peanuts. A wood-handled cheese spreader is included in this gift basket. Everything comes arranged inside a reusable decorative container. You are sure to brighten their day when you surprise your loved one with a basket full of wine themed gifts.